On a cold night every December, I fill container upon packed container with non-cash charitable contributions. 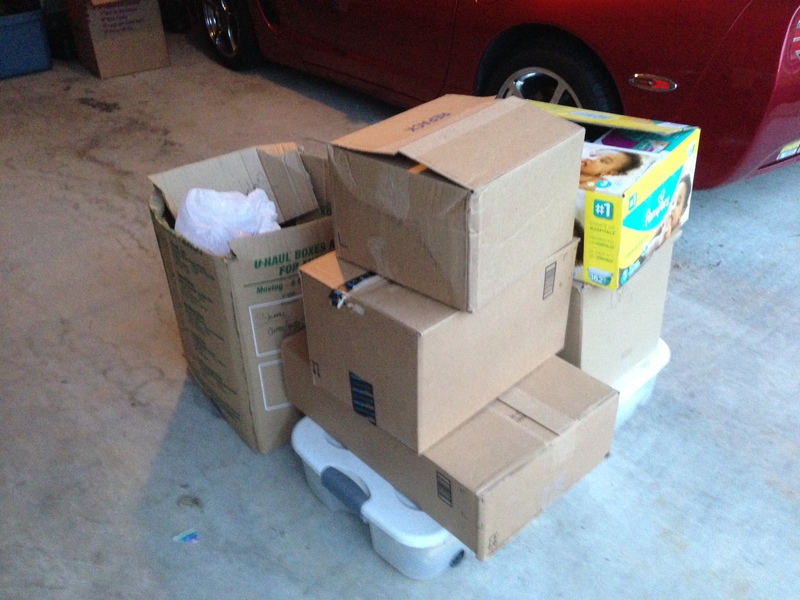 These diaper boxes and plastic totes wait in my driveway ’til morning, when the Vietnam Veterans of America pick them up and leave a small slip of paper in their absence (assuming the boxes haven’t been stolen). Our mini fridge, a pleather recliner from my bachelor days, and my copy of The Exorcist: Remastered are loaded up never to be seen again. A violin whines somewhere in the distance. But, the sense of loss is quickly replaced by another sense….Freedom! Boxes upon boxes—GONE! Empty shelves, drawers, cabinets and crawlspaces reveal themselves. I retrieve that hastily tossed slip of paper and, using the price estimation guide from Goodwill.com, I calculate how all of my donated household goods have transformed themselves into a hearty non-cash charitable tax deduction. Success! Don’t get my wrong, I’m still a fan of your traditional cash variety charitable contributions. We’ve given our hard-earned dollars to many churches, Greenpeace, PETA, the Boy Scouts, UNHCR, and several others. I never want to discourage any form of charitable giving (except to maybe some of these charities). So, it’s great that the average American donates over $1,000 to charities each year. However, the trouble with your run-of-the-mill charitable deductions is that you have to outlay some money in order to get the deduction. The world’s worst person would say, “I’m losing a dollar to gain a quarter!” I would say, in addition to your normal charitable giving, there exists a huge untapped charitable resource sitting all around you: your stuff. As my pal David writes about at Raptitude, everything you own is a relationship you are in. Some of those relationships are fruitful. Those are items you use frequently and that hold real value in your life. But, most things you own aren’t a good relationship. These are items that are simply bothersome. Clutter. You see them and you go the other way. There are a few ways you can simplify your possessions. Burning. Selling. Donating. In a strictly financial sense, selling is certainly the most lucrative. I’m a huge proponent of selling. The problem with selling, though, is that so much of what we own may not suitable for sale or practical to sell. There is also that pesky requirement with selling that you must agree with another person in an arm’s length transaction. Not so with donating! That old leather belt that only qualifies as a “belt” when using only the loosest of definitions is as good as a $3 deduction as any (kinda kidding). The IRS does require that clothing and household goods must be in “good used condition, or better” in order to qualify for a tax deduction. This quickly rules out my Zubaz sleep bottoms and all but just a couple of my pairs of underwear (kidding again). However, “Good Used Condition,” however subjective, still describes so much of what is in our homes. For many of us, stuff comes into our lives with such little effort or planning that we quickly find ourselves swimming in mountains of it. This is especially true when you combine households with your spouse or significant other. 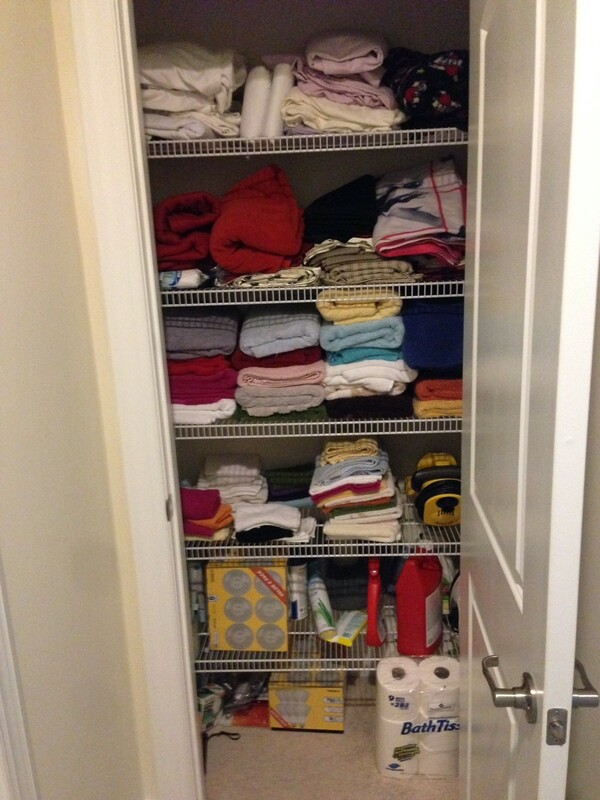 Look at this photo of our linen closet before we gave it a purge last winter. How many towels is that? Thirty? Two rows deep. And this doesn’t include what was already hanging in the bathroom. For two adults. Also in there are several sets of full-size bedsheets (we don’t own a full-size mattress), a couple tablecloths, and various other things. Yah, that’s partly just doing some folding, but it’s also getting rid of a lot. This isn’t a life-changing difference, but it certainly feels a lot better when I have to go grab a towel. Amazingly enough, I don’t even feel deprived by only having six towels to choose from instead of thirty. Keep in mind that we’ll do this every year, mostly just to keep up with natural additions, but also to gradually pare down our material lives. In this pile is about ten dress shirts, over 100 DVDs, 50 books, 20 ties, and a ton of other stuff from exercise bands to rechargeable batteries. All told, I valued it at about $430. While charities have the right to refuse your donations, I’ve never had that happen. Wait, scratch that. I think one charity wouldn’t accept old school CRT TVs, so we ended up trashing it. However, most items are in like flynn. I said above that donating is a one-sided transaction. While generally true, you do need to make good with the IRS. You do this by keeping good records to back up your non-cash charitable contributions. Unlike with cash, where receipts are a straightforward affair, non-cash has it’s own rulebook. Document everything you donate and include it with a signed, dated receipt from a qualified charitable organization. (Photos are great). Value each item individually at its fair market value (i.e. whatever a thrift/consignment shop would sell it for). All items must be in good used condition, or better. For individual items valued >$500 or for things like art or jewelry, then there are some varying rules (see Pub. 561 for details). However, for your normal clothing and household goods, those are the three pertinent rules. That said, there are some additional things to keep in mind if you want to avoid deep scrutiny. Form 8283: The IRS requires that an individual files a Form 8283 if the total value of all donated property is above $500. Merely the inclusion of this form is a red flag to a tax reviewer. As such, I try to always keep my donated property under $500 in any given year. This isn’t in an effort to circumvent any laws or do anything illegal (I’m not like, valuing a single pair of socks for $499.99 or anything), it is simply a means to avoid future headaches. Unique Clothing or Goods Items: Say you’ve got a pair of ’88 Air Jordan OGs and you say, “Hell, I don’t need these anymore.” You donate them at the fair market value of $4,500. The trouble with types of items that are in less than good condition, hold some collectible value, or are valued above $500 is that they require an independent appraisal. You also need to show how the item was acquired, when it was acquired, and your cost basis. Lest I discourage you from donating your Jordans, I’ll simply say this is all too much trouble for me. I’ll stick with low-ish value items only. It’s never been easier to find a charity that will come to your house and pick up your junk. In the D.C. area where we live, we’ve always used Vietnam Veterans of America, the Lupus Foundation, or Purple Heart Pickup. However, since the world is large, there are sites like DonationTown that will tell you which charities cover your zip code, coast to coast. There are two ways to accomplish most things: Slowly and quickly. We do both. Quickly: Then, near the end of the year (although you could obviously do this whenever), we’ll do a scrub of some problem area, like a garage, storage space, kitchen or linen closet. This is a family affair, and feels really good to see that immediate return on investment. The value of doing these donations is threefold. Money. There is a small monetary benefit. If I donate $450 per year, then I’ll realize a tax benefit of ~$100 per year. Altruism. Most clothing that is donated, so I’ve heard, is sold to textile recycling plants. A small fraction (about 10%) of clothing, and most household goods, go into thrift stores or the like. I’m not really bothered by this, as the charity stills serves a good purpose with those revenues regardless of the means of distribution. Freedom. This is certainly the best benefit for us. We have less stuff to bog down our minds and spaces. Which just feels good. I hope this has inspired you to take a critical eye toward some of the crap in your life. Put a couple boxes together and see how you feel. I bet you will be happy that you did. Looks like the US really has an extensive way to donate. As far as I know, I Belgium, we only have cash donations. If given to an approved organization, there is a tax benefit. Our clothes we don’t need any more are offered to friends and family (especially from our kids). The left over is given to charity, either via a person we know and trust that collects these, or deposited in big collector boxes in the streets. No tax advantage here. The fact that we create free space in our house is the biggest benefit for us. 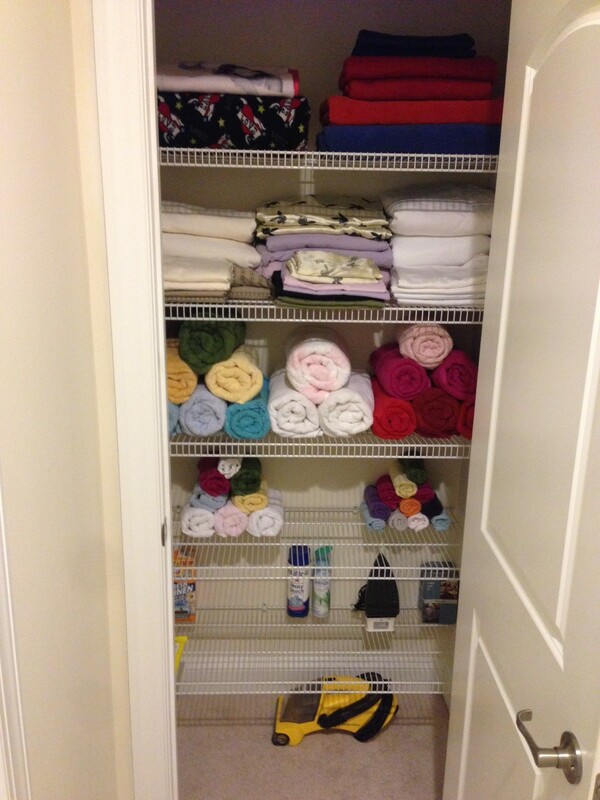 It avoids extending the storage space or overfill the wardrobe. I love this post! I tend to resell what I can on eBay but some items just aren’t worth the hastle, like baby clothes. I hate to throw out stuff that still has lots of useful life and the tax deduction is a nice bonus. Thanks for outlining how to do that. Really late commenting, but I just clicked over from your newest post. I am on the board for another non-profit and they sort through all the clothes looking for premium brands and then other items that will sell. Everything else gets sold to a recycler by the pound. That being said, they are very gracious for any donation, so as long as its not trash they try and make it work!